Bike commuting is common in most cities in the world. Over the last decades more and more bikes have made it to the road thanks to the numerous health and economic benefits associated with biking. However, despite this upsurge in use, the biking community needs to understand the safety demands of biking. For starters, your bike should be in perfect condition to hit the road to avoid any mechanical failures that can result in an accident. Also, follow the road rules and watch for the actions of your fellow road users. In a nutshell, there are a lot of risks you need to take care for while riding. However, by basically applying these simple yet crucial tips while you cycle, you can significantly reduce accident chances. Need a good bike for commuting? Check out recommended road bikes and e-bikes. Many bike accidents happen when cyclist ignore pertinent road rules. Also, cyclists have the similar obligations as drivers on the roads and are expected to follow the same rules. This means you need to stay in your lane, yield when necessary, follow traffic signs obey, traffic lights at all times and use the lane on your right depending on the direction you are headed. Always remember, your safety on the road depends on nobody else but you. As a biker, the role of proper gear in your riding cannot be overstated. You should as well have proper safety equipment including a well-fitted helmet, protective gloves, front lighting, a red light on the back, and a repair kit in case of emergency. A well-fitted helmet is vital in protecting you from a head injury. Furthermore, proper bicycle maintenance will go a long way in preventing accidents on the road. Not all the roads on your way to work have bike lanes and bike paths. You can steer clear of many hazards and reduce your risk of being in a bike accident by just choosing a route with less traffic and fewer intersections. If you are selecting a route that you will be using on a regular basis, you should also look for good scenery, so you don’t get bored. Many bike accidents are caused because drivers of motor vehicles are unaware of a cyclist’s intent. 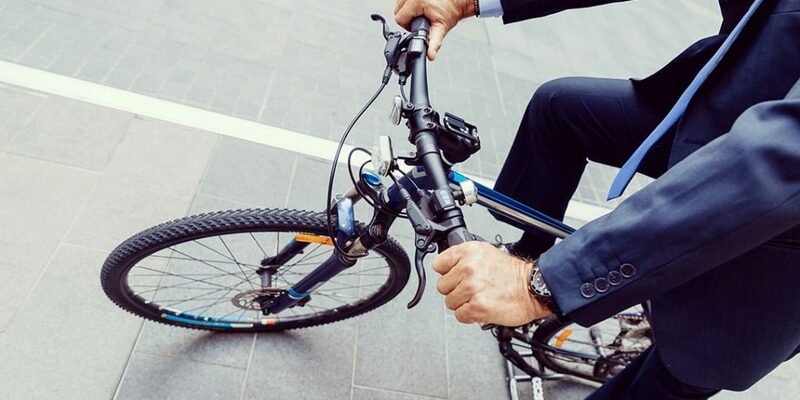 You can avoid potential bike accidents by signaling every directional change you make, using a horn or whistle in case of emergency, and make eye contact with those around you. Hand signals can also aid you to communicate your intentions, but do not lose control of your bike. As a cyclist, you are exposed to a much higher risk of being involved in an accident when you ride sporadically. Make your intentions clear to your fellow commuters on the road. Ride in a decent manner and signal at every turn you take while checking before changing lanes. You can enjoy a much safer commute if you make a signal for every directional change you make, and pay attention to the traffic around you at all times. An important rule while biking is to ensure other people can see you. Since bikes are smaller than any other vehicle on the road, they can be difficult for other people to see. Accidents involving bikers tend to occur at intersections due to low visibility. You can avoid these types of situations by wearing bright clothing or riding where people can see you. Additionally, you can use a colored rear light or reflectors in foggy weather. Always make eye contact with others. Stopping is not a challenge for most cyclists, but there are still some bad habits to lose and good habits to learn regarding dismounting from your bike. Dismounting your bike is much easier if your bike fits you properly. Begin to brake as you approach your desired spot using both brakes while using your front brakes lightly. Whether you are a right or left-hand person, it is advised to get off the left side of the bike. Tensions tend to always run high on the roads. Despite the fact that it is in public space, people can be aggressive even when they know they are in the wrong. As a road user, you should be patient with other people to avoid confrontations and situations that can lead to dispute. Avoid road bullying other road users and riding on the pedestrian walks and paths. Bikes are revolutionizing public transport in major cities in the world today. However, to make the most out of them, we must ensure we adhere to basic safety measures as highlighted above.